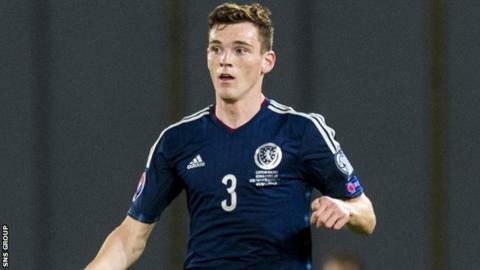 Andy Robertson has been called up for Scotland's Under-21 Euro 2017 qualifier at home to Ukraine on 13 November. The 21-year-old Hull City left-back has eight full caps, but the senior side are not in action this month. Celtic midfielder Liam Henderson, on loan at Hibernian, makes his first appearance at this level, with Rangers winger Barrie McKay earning a recall. Manager Ricky Sbragia is without suspended Sporting Lisbon midfielder Ryan Gauld. The former Dundee United playmaker was given a two-match ban following his dismissal in last month's 2-1 loss to France and missed the following 0-0 draw with Iceland. Ipswich Town winger Ryan Fraser is out through injury. Since the the senior team are without a match, Scotland boss Gordon Strachan will form part of the backroom team, says the Scottish FA. The young Scots have picked up four points from their opening three matches in Group 3, with Ukraine losing their first three games. Iceland top the section on 11 points from five outings, with France and Macedonia also ahead of the Scots. Nine group winners will automatically qualify to join hosts Poland in the finals, with two more places being decided via play-offs between the four best runners-up.